We have seen echo statement quite requently in PHP codes of previous article. It is the most basic way for displaying output in PHP. In PHP ‘echo’ statement is a language construct and not a function, so it can be used without paranthesis. But we are allowed to use paranthesis with echo statement when we are using more than one arguments with it. The end of echo statement is identified by the semi-colon (‘;’). Hello,This is a display string example! The (.) operator in the above code can be used to concatenate two strings in PHP and the “\n” is used for a new line and is also known as line-break. We will learn about these in further articles. The PHP print statement is similar to the echo statement and can be used alteranative to echo at many times.It is also language construct and so we may not use parenthesis : print or print(). 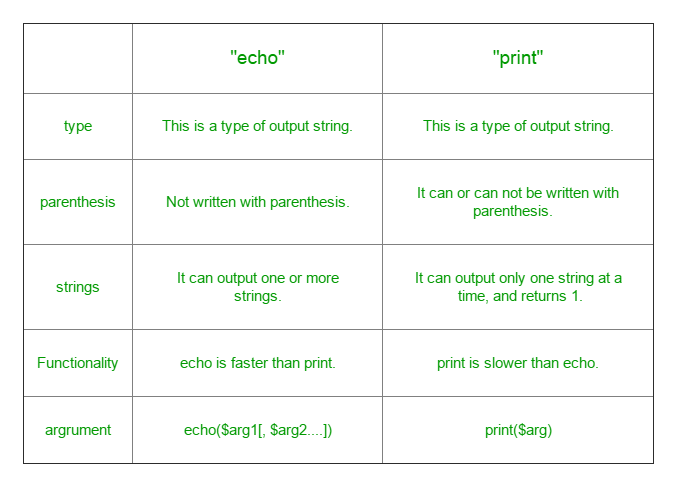 The main difference between the print and echo statement is that print statement can have only one agrument at a time and thus can print a single string. Also, print statement always returns a value 1. This article is contributed by Barun Gupta. If you like GeeksforGeeks and would like to contribute, you can also write an article using contribute.geeksforgeeks.org or mail your article to contribute@geeksforgeeks.org. See your article appearing on the GeeksforGeeks main page and help other Geeks.